Soon the floor will be littered with brightly colored paper, torn hastily from boxes. Trash and recycling bins will be stuffed to the brim. Sounds of new gadgets and devices will be filling every room in the house. As you walk the room, offering a trash bag to anybody who will add to it, you'll remember the care you took putting on all that pretty paper, those shredded bows. Hours to wrap, minutes to destroy. But that's half the fun, don't you think? Today I'm here to offer some last minute ideas for holding a gift wrapping party! If you can carve out an afternoon or evening with some of your friends the week before Christmas, one of these parties can be a much-needed break from the madness. These are just a few ideas to get your creative juices flowing. PICK A THEME: You can go as basic or specific as you like. Change it up each year! Some ideas are snowflakes, Santa Claus, Natural (think raffia and jute, pine cones and sprigs, holly and pointsettias, etc), Snowmen, Christmas Trees, Birds, Jingle Bells, Musical, Nativity, ugly sweater, cartoon. The possibilities are endless! PICK A COLOR SCHEME: Something that matches the theme. I've included a few ideas to get the juices flowing. Again, endless possibilities. I'd stick with about 3 colors at the most for most themes. ASSIGN TASKS: Be sure to tell everybody the theme and color scheme and ask them to stick to it. Each person you invite can bring one item, based on the theme and color scheme. Have a couple of people bring 2 or 3 rolls of wrapping paper each. Have another bring bowls, ribbons, and raffia. Have another bring gift tags. Have a couple other people bring gift bags in assorted sizes. Don't forget to have somebody grab tiny gift card boxes and bags for alcohol bottles. Be sure that you have lots of large, flat spaces for spreading out. Don't invite more people than your space can handle, or you won't be productive. Have an extra table that has been "divided" and labeled for each person to stash their wrapped gifts while they keep working. As the host, be sure to have lots of fun colored pens (gold, silver, red, green - fit the color scheme, if you can) handy. Also have plenty of tape and scissors (or have everybody bring a pair). Also, be sure to grab something fun and unexpected that relates to your theme. If you choose snowflakes, grab a box of sparkly snowflake ornaments for people to attach to their wrapped gifts. If you choose jingle bells, grab a few boxes of bells in different sizes and thread that will fit through the holes, for each attaching. I'm a very "personal" type of wrapper, so if I have the chance, I like to buy a huge roll of brown paper (like butcher paper), and natural (undied, undecorated) gift bags and tags in various sizes, plus a bunch of jute and twine that has been naturally colored. Include rubber stamps and ink pads to fit your theme and color. Create a signature cocktail to serve your friends. If you can make it fit the theme (name, ingredients, color, even just the napkins) you get bonus points! Food that fits the theme is great, too...but either way, just be sure to have plenty of easy to eat food on hand for munching (and be sure it's nothing too messy). Or make a big spread and make it the reward once all of the gifts have been wrapped! Do it all yourself, or make it a potluck. 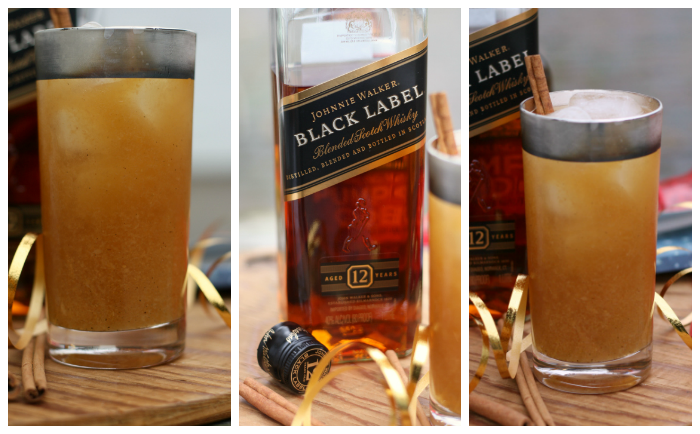 This year, my theme was snowmen, my color scheme was red, blue, and gold, and I made this Spiced Pear-Pumpkin Whisky Fizz the signature cocktail. The cocktail itself was fairly "golden". I used red and blue cocktail napkins. Simple, but still fun. 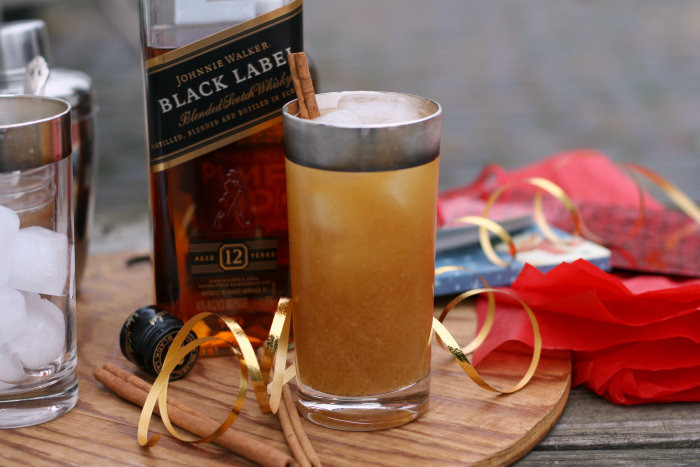 A little bit of fizz and a lot of spice lend this whisky cocktail, flavored with pears and pumpkin, some holiday pizzaz! Fill a cocktail shaker halfway full with ice. Add the whisky, pear butter, and lemon juice. Shake until cold. Strain into two glasses filled 2/3 of the way with ice. 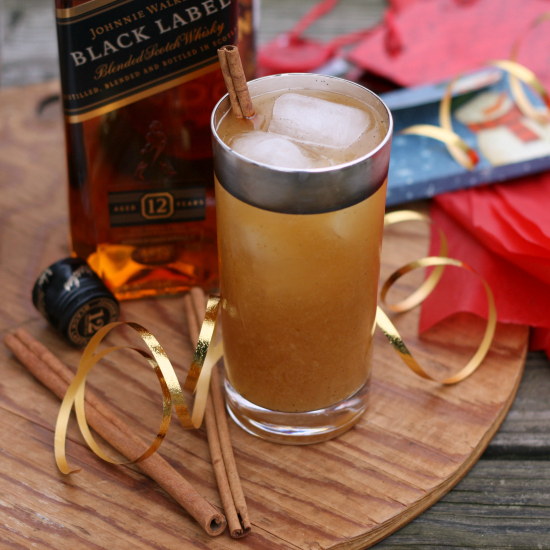 Top off with Sparkling Pumpkin Cider. Garnish with a cinnamon stick, if you wish. If you can't find the Sparkling Spiced Pumpkin Cider, feel free to substitute sparkling apple cider; add a pinch of pumpkin pie spice and a tablespoon of pumpkin puree. Do you have any tips, tricks, or ideas for hosting a gift wrapping party? 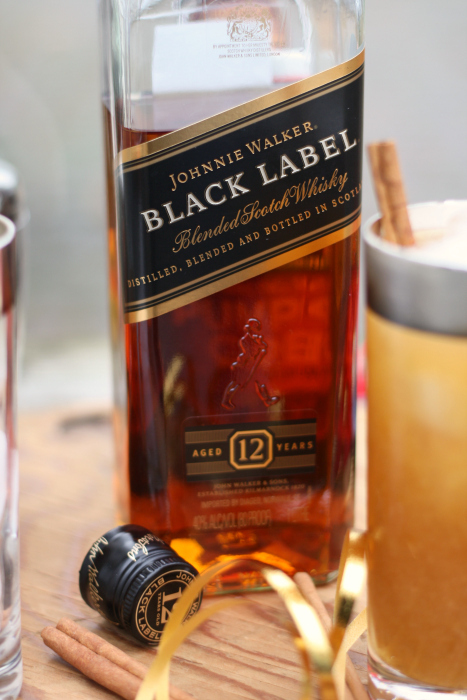 I received a free bottle of Johnnie Walker Black Label Whisky for the purpose of recipe development.